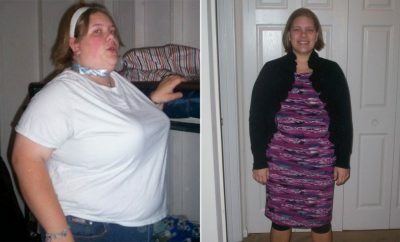 How I Gained It: I have struggled with my weight since the fifth grade. I can remember being in the gym locker room in middle school and being so embarrassed because I didn’t “look like” all my friends. Looking back, it seems like I’ve been on a diet my entire adult life. My transition from being a little chubby to tipping the scales at 261 pounds was definitely a slow process. I didn’t pack on the weight really fast. I know there were certain points in my life when I actually recognized just how much I had gained — the biggest moment was on my wedding day. The day was absolutely amazing, but I remember feeling self-conscious about the way I looked. In my late twenties, I was diagnosed with PCOS, which is unfortunately a weight-driven syndrome that complicates many systems in the body. It can also lead to infertility. I think when I was diagnosed with the PCOS it was the last nail in the coffin. From that point on I really gave up on losing weight. Breaking Point: It was the summer before my 35th birthday, and I was sitting at my desk at work. I just had one of those “light bulb” moments where you see the crossroads in front of you. For me I just broke down and kept asking myself “Is this really all there is? Are you going to just accept that you will be overweight for the next 35 years?” It was in that moment that enough was enough. I was done. Completely and totally done with being unhealthy and not getting everything I wanted out of life. 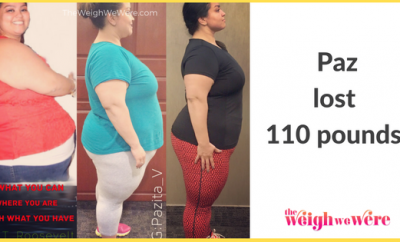 How I Lost It: I looked into many different weight-loss programs. I even went to a consultation with a bariatric surgeon to see if I was a good candidate for the gastric bypass. I’m so thankful that one of my avenues to explore was applying for “The Biggest Loser.” It seemed like such a far-fetched idea at the time, but I am beyond thankful I gave it a shot. I lost 129 pounds on the show’s 11th season. It was the most life-changing experience I have ever had the privilege of going through. I learned that weight loss happens from the inside out. For the first time in my life I was really working on my body, mind and spirit. It’s not just about “beating the fat out” through exercise, but really taking the time to figure out what got me to this weight in the first place. I’m incredibly proud of my scale victory, but I’m the most proud of the work I did internally. It was a very rude awakening when I was made aware just how many calories I was taking in on a daily basis — it was thousands. Learning the basic principle of calories in, calories out was a huge eye-opener. 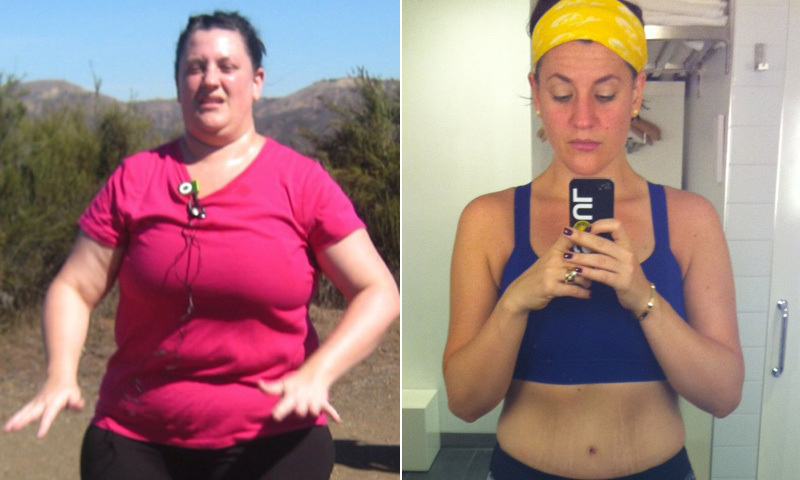 I was so incredibly thankful that “The Biggest Loser” introduced us to the BodyMedia device. It was my lifeline. I used to always ask people to “hold me accountable” when I was on many failed diets. With the assistance of my BodyMedia, I could hold myself accountable for the first time in my life. It keeps you informed every step of every day. It has been two years since I left the “Biggest Loser” ranch, and I still use my BodyMedia. I will never go through my health journey blind again. I was also fortunate to go through this journey with my sister Hannah. She was my partner on the show, and she continues to be my partner in life. She supports me and holds me accountable when I need to be. Going through this process with her has been the gift of a lifetime. Hannah and I have also started a company together. We began myFitspiration shortly after our season of “The Biggest Loser” ended. We have a YouTube channel where we continue to post videos on anything and everything about healthy living. It’s a great way for us to stay in contact with all the viewers that supported us during the show. It’s an amazing community of people we are building. 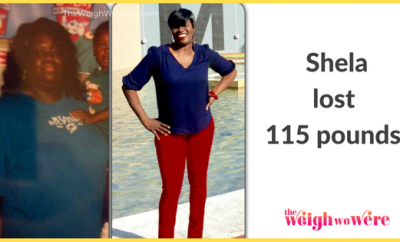 My husband also lost weight when I was on the show — 113 pounds on his own. I’m so incredibly proud of him. Instead of sitting around all the time, now we take walks or try fun workouts together. I am currently in the instructor training program at SoulCycle in New York City. I want to give back as much as I can, and teaching cycling is such a great way for me to do that. I have been going to SoulCycle for two years, and it has really been a huge part to my maintenance success. I look forward to the day I teach in their studios. ← Previous Story 53 pounds gone and more to go!